Route maps (Map 8), (Map 9). Walking distance Three kilometres of mainly hill walking. Purpose To examine the Comrie Igneous Complex and its metamorphic aureole in the surrounding Dalradian rocks of the Southern Highlands. 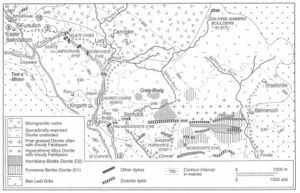 The Comrie Igneous Complex (408 ± 5 My, and thus on the Siluro-Devonian boundary) is one of about forty Newer Granites in the Caledonian Province of Scotland. Comrie in many ways is typical of the Newer Granites though in two respects it is unusual. Firstly the pluton is isolated, such plutons commonly occurring in clusters, and secondly its long axis runs counter to the strike of the enclosing Dalradian country rocks. The Newer Granites are calcalkaline in chemical composition and fit the I–type category of granites. Such granites are typical of the Cordillera and for this reason the Newer Granites have been interpreted as being related to Caledonian subduction, though this view is not universally accepted. 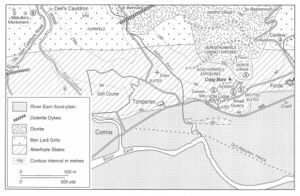 The Comrie Complex is part of the South of Scotland suite of granites as it has more affinities chemically with plutons in the Southern Uplands and along strike to the south-west in the Grampians than with the plutons of the Argyll and Cairngorm suites (Stephens and Halliday, 1984). Many of the Newer Granites show features of compositional zoning, usually from an outer diorite or granodiorite into a core of true granite, and Comrie is again typical in this respect with a dioritic margin and a granite interior. The origin of such granites has been reviewed by Brown (1991). The major part of the complex is composed of diorites and measures roughly 8 km by 3 km. It is intruded by a plug measuring 2.5 km by 1.5 km of fine- to medium-grained pink 'microgranite'. This varies from a pink aplite to a granodiorite composed of quartz, plagioclase, orthoclase, biotite and magnetite. Within the diorite part of the complex two important types can be recognised. (1) One- or two-pyroxene diorite; this is rectangularly jointed, dark grey in colour and contains clinopyroxene, with or without hypersthene, and biotite as the chief mafic minerals. Interstitial micropegmatite occurs and the plagioclase feldspar is sometimes cloudy. (2) A medium- to coarse-grained, grey to pale grey, rough-weathering diorite in which hornblende, probably after pyroxene, and brown biotite are the important dark minerals. Interstitial quartz occurs and locally can be fairly abundant. In addition to these two leading types there are a number of variants including microdiorites containing phenocrysts of andesine feldspar. Their distribution over the complex has not been mapped out in detail. Within the country rock round the Comrie Igneous Complex two main rock types occur, the psammitic Ben Ledi Grits and the pelitic Aberfoyle Slates, both part of the Upper Dal-radian Southern Highland Group, the latter seen only in the south of the area. Structurally they are involved in the 'steep belt', adjacent to the Highland Boundary Fault, and pass north-west into the 'flat belt' (Harte et al. 1984). They lie in the nose of the main recumbent Early Caledonoid D1 Tay Nappe, subsequently refolded by the later Caledonoid D4 monoformal 'downbend'. Both these structures trend NE–SW. The steep dips seen in the Aberfoyle Slates and Ben Ledi Grits lie on the south-eastern limb of the D4 monoformal downbend. To the south-east these highly folded metamorphosed sediments are separated from the unmetamorphosed Lower Old Red Sandstone sediments of the Midland Valley by the Highland Boundary Fault. The Aberfoyle Slates were said by Tilley (1924, p. 25) to lie in the chlorite zone of regional metamorphism. Within them, on entering the aureole of the Comrie Igneous Complex, he recognised the following zones of thermal metamorphism: (1) slates (the unaltered country rock); (2) spotted slates in which no chemical reconstruction has taken place, but in which there is a loss of fissility; (3) development of biotite in tiny flakes, which increase in size towards the contact, accompanied by a further decrease in fissility; (4) a zone of true hornfelses with complete loss of fissility and appearance of cordierite, giving the rock a purplish appearance on a fresh surface. Zone 2 appears about 425 m from the contact, Zone 3 at about 270 m from the contact and Zone 4 at 135 m from the contact. Within Zone 4 Tilley distinguished among others a silica-rich type characterised by cordierite and hypersthene, and a silica-poor type characterised by cordierite, spinel, corundum and sometimes biotite. These two types are not distinguishable in the field. Induration is generally the first sign of thermal metamorphism in the Ben Ledi Grits, spots appearing concurrently in the interbedded argillaceous bands. Biotite replaces chlorite and white mica in the vicinity of iron ore at about 450 m from the contact with the diorite. At 250 m from the contact true hornfelses appear, andalusite appearing in the argillaceous bands along with cordierite, the biotite now occurring in large flakes. At the contact the hornfels is coarse grained and almost of granitic aspect with conspicuous biotite. Original sedimentary banding may survive dose to the contact as may the fracture cleavage seen in the Ben Ledi Grits along almost the whole length of the Highland Boundary Fault. At the northern end of the diorite the progressive thermal metamorphism of an epidiorite (a regionally metamorphosed dolerite) can be studied. Outside the aureole the epidiorite is composed mainly of hornblende, sodic plagioclase and zoisite, with minor epidote and chlorite. Approaching the diorite, magnetite appears in the hornblende and the small hornblendes change into biotite while zoisite and epidote disappear and the plagioclase becomes more calcic. Finally, close to the contact the rock becomes a granular pyroxene–hornfels containing hornblende, diopsidic pyroxene, hypersthene, labradorite, biotite and iron ores. Follow A91 westwards to Cupar (16 km) then by A913 north-west through the North Fife Hills (Excursion 7) composed of Lower Old Red Sandstone volcanics, to Newburgh (16 km) overlooking the Tay and the Carse of Gowrie beyond. The North Fife Hills composed of SE-dipping volcanics are matched on the other side of the Tay by Lower Old Red Sandstone volcanics dipping to the north-west in the Sidlaw Hills on the other side of the NE–SW trending Sidlaw Anticline. After 7 km join A912 for 21 cm leading to M90. Notice the spectacular road cut on Moncreiffe Hill in Lower Old Red Sandstone basic pyroxene-andesites. Follow M90 round the west side of Perth to A9 before leaving on A85 which runs along the north side of Strathearn to Crieff (27 km). Note the very red soil derived from the Lower Old Red Sandstone, here in the centre of the Strathmore Syncline. The south side of Strathearn is marked by the Ochil Hills composed of volcanic rocks dipping north-west into Strathmore. From Crieff travel west on A85 for 8 km to a caravan site on the north side of the road [NN 785 225] on the outskirts of Comrie, and dismount. On the main road walk 50 m east from the caravan site to a gap in the wall and a wooden gate on the north side of the road. This leads to a forest trail which starts on the old drive leading east to Fordie. One hundred and fifty metres east of the end of the drive examine the Aberfoyle Slates in a small cutting. They are fine grained, light grey in colour and the cleavage dips steeply north. There is a horizontal lineation on the cleavage surfaces. The slates lie in the chlorite zone of regional metamorphism and there is no trace of thermal metamorphism at this point. A small quarry 180 m further east on the north side of the road has good exposures within the slates with silty and sandy bands showing original sedimentary structures and quartz veins and blebs in the more siliceous rocks. The bedding dips 80°–85° N and the cleavage 75° N. Spotting, indicating the first stages of thermal metamorphism, is present in the argillaceous rocks, but is poorly developed and not obvious. Forty-five metres beyond the quarry a 3.5 m high bluff of slates on the north side of the road is partly covered by a large Cotoneaster bush and here spotting is well developed. On fresh surfaces the spots are slightly darker than the surrounding rock and are up to lmm in diameter. At a left hand bend in the road 120 m east of the quarry slates show larger spots up to 3 mm across and the rock is noticeably less fissile than hitherto. Thin silty bands occur and are often crumpled. Continue east along the Fordie driveway for a further 150 m and then take the forest walk steps which lead north-west to the summit of Craig More. The first exposures, reached after following the path for about 250 m to a large fallen tree, form part of a large bluff mainly on the right of the path. They comprise fine-grained, now purplish, splintery hornfels with none of the original fissility of the slates. Thin sandy and silty siliceous bands make up about 30 per cent of the rock and isoclinal folds can be seen in many of the exposures. The purplish colour, common in cordierite-bearing hornfelses, marks a much higher grade of thermal metamorphism and is found within 100 m of the contact with the diorite. At the root of the fallen tree is a lm porphyrite dyke (trend 170°) with the contact well exposed and chilled margins. The pitting on the surface of the dyke corresponds to feldspar phenocrysts within it. Follow the path for 180 m to the summit of Craig More and a bench seat fixed to a large, clean, glaciated exposure of hornfels. From this seat there is an excellent view of Strathearn and of Glen Artney lying on the line of the Highland Boundary Fault with SE-dipping sediments of the Lower Old Red Sandstone Arbuthnott Group beyond. To reach the contact between the hornfelses and the diorite, leave the path and walk 60 m north-east to a large oak tree at the head of a gully in the east-facing crags. Descend this gully for 20 m and just to the north will be found the contact. The hornfels, showing strong banding, overlies a pinkish more granodiorite-like development of the Comrie Complex. This is readily recognised by its quite different blocky jointing and pinkish colour. Hornfels xenoliths are common. Near the contact, which is irregular, the hornfels is much coarser grained and can be difficult to separate from the granodiorite. Grey D2 hornblende-diorite is exposed 200 m further east in low knolls overlooking a field to the east. Return to the seat and then follow the path west along the summit of Craig More for 250 m to where the path turns south and 70 m downhill to another bench seat, also on a fine glaciated knoll, this time on medium-grade biotite hornfels, still hard and splintery but no longer with a purplish hue, and in which bedding and quartz veins can be seen. Now follow the fenced path for 200 m down to another glaciated knoll level in height with the tops of the large redwood trees lining the Fordie driveway below. The knoll comprises spotted slates, once again fissile, and much further from the outcrop of the Comrie Igneous Complex. They are cut by a NE–SW trending columnar-jointed lm wide dolerite dyke. Contrast the jointing of the two rock types. Now follow the path back down to the road (190 m) and rejoin the bus. Take the bus through the town of Comrie to follow the Glen Lednock road north-west for 1.5 km to a lay-by where the bus can be parked [NN 767 235]. This is just beyond the footpath leading up to Melville's Monument. The monument, high above the road to the south-west, stands on slates and siltstones, within the Ben Ledi Grits and showing no evidence of thermal metamorphism. Take the signposted footpath and staircase down to Dell's Cauldron overlooking a waterfall in the River Lednock. Although the cauldron is some 500 m from the mapped margin of the Comrie Igneous Complex, the Ben Ledi Grits, still with fracture cleavage, are now high grade rather siliceous hornfelses, and the clear implication is that the roof of the complex must slope outwards at gentle angles such that the contact lies at no great distance beneath the surface. The fracture cleavage is no longer a plane of parting, on account of the thermal metamorphism that the rocks have undergone. Take the bus on up the glen for 500 m to where the footpath leading to Shaky Bridge and Balmuick leaves on the right, and walk 230 m down the path to the bridge [NN 763 243]. At this point there are good exposures of the marginal, coarse-grained xenolithic D2 diorite, a rock containing conspicuous biotite and interstitial quartz together with andesine feldspar and amphibole after clinopyroxene. Return to the bus and continue up the glen, noticing the rock barrier across the glen, 800 m above Shaky Bridge, through which the River Lednock has cut a small gorge. There is a considerable amount of hummocky moraine in this vicinity. In the last 800 m before reaching Funtullich a broad alluvial plane on either side of the road obscures the west margin of the diorite. At Funtullich 36 m beyond the farmyard wall a tongue of high grade hornfels crosses the road and runs on into the diorite for 90 m to the north-east. The hornfels is highly quartzose and contains subordinate feldspars and biotite. It is cut by veins of microgranite. This rock also crops out immediately to the north-west of the hornfels and also west of the road and can be distinguished by its widely spaced, flat lying or gently dipping joints. This is an isolated outcrop of microgranite lying some distance from the main plug, and its relationship to the latter is obscure, as are those of several adjacent small patches. The microgranite may be examined on the west side of the road in front of the small, isolated stone house, the old school house. The rock is pinkish in hand specimen and consists principally of quartz, oligoclase feldspar and biotite with some micropegmatite. Small xenoliths of hornfels are common. Behind the small house and 22 m to the west finer-grained, dark grey microdiorite crops out beyond the microgranite. It is cut by a 30 cm thick pink micro-granite vein with sharp contacts but no chilled margins. A similar microdiorite occurs at the roadside level with the house. One hundred and eighty metres north-west of the house, beyond an old gravel pit, the microdiorite is paler in colour, porphyritic, and contains small hornfels xenoliths. In thin section the microdiorite often bears cloudy feldspars with clear rims, biotite and pale green amphibole. Hypersthene occurs near the contact with the country rock, and quartz, zircon and sphene occur as accessory minerals. Follow the track east from Funtullich for 450 m to a gate through the wall on the north side. Forty-five metres north of the gate rock ridges trending NE–SW are composed of high-grade cordierite hornfels cut by veins of microgranite and diorite. The purplish colour is particularly noticeable on fresh surfaces of the hornfels. The rock ridges apparently conform to the strike and original sedimentary banding in the country rock. This may be part of a very large inclusion within the diorite, but lack of exposures precludes proof of this. Continue to the north passing about 30 m west of the solitary tree in this field across diorite of variable composition and then 140 m north-west to a gate in the wall. Just south of the gate the margin of the main microgranite mass is reached. The rock here is quite fine grained, but on the north side of the wall it is much coarser in grain and very similar in composition and appearance to the microgranite at Funtullich. Ninety metres to the west and just above the wall is a rocky bluff with a single tree growing in a crack in the rock. At this point the steeply dipping contact between the west margin of the microgranite and the main diorite mass can be seen in a 30 cm deep gully in the face of the crag at the base of the tree. The microgranite is again similar to that at Funtullich while the diorite is medium- to coarse-grained, the grain size increasing to the west. Xenoliths of both diorite and hornfels occur in the microgranite and pink almost aplitic veins cut the diorite, the microgranite and some of the xenoliths. Conspicuous coarse joints in the diorite dip gently to the east. Looking up the hillside to the north-east the approximate line of contact between the diorite and the microgranite is indicated by the colour contrast between the dark grey crags of the former and the pale pink of the latter. Return to the bus by continuing along the wall to the west past outcrops of coarse-grained diorite till the corner of the wall is reached and then walking south-west to Funtullich. Take the bus up the glen for 3 km past Invergeldie, noticing the prominent rock face of Spout Rolla in front of the dam. Formerly a waterfall, this is now usually dry. It lies within the diorite aureole and comprises hornfelsed grits within the 'flat belt' (Harte et al. 1984). Leave the bus at the start of the large Z-bend just above the bridge over the Lednock [NN 728 286]. The epidiorite at the bridge is part of a regionally metamorphosed dolerite sheet intruded into the Ben Ledi Grits before the regional metamorphism of the area, i.e. 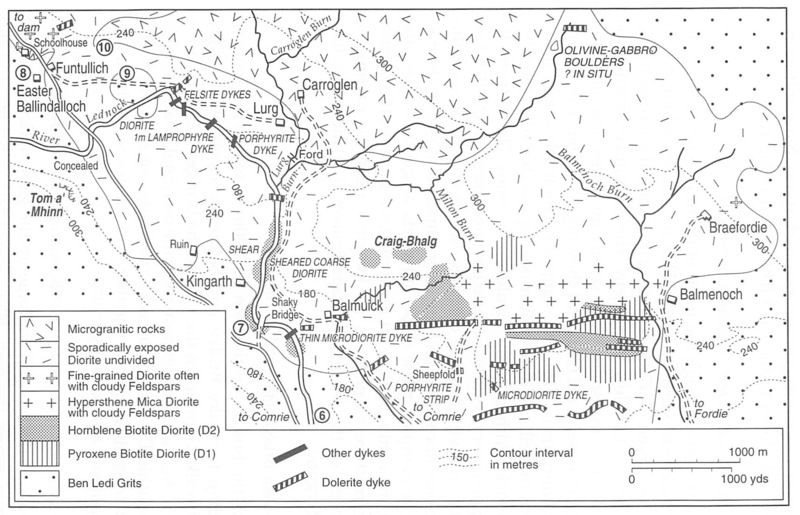 it is one of the Older Basic Intrusions within the Dalradian rocks (Johnston 1966, p. 45). It is very varied in appearance and occupies much of the bed of the river between the bridge and the dam. A contact with the country rock can be examined on the west bank of the river at a small waterfall 10 m downstream from the bridge, but it is apparently sheared. Upstream different types of epidiorite recur in many exposures, some being very coarse grained with amphibole crystals up to 2 cm long set in a more feldspathic matrix. These large amphiboles sometimes show a strong preferred orientation. Elsewhere the rock is medium- or fine-grained but contains dark streaks and blotches of the coarser-grained material. McDonagh (1964) believed the epidiorite sheet to consist of a lower coarse-grained member and an upper medium-grained member intruded separately. Pink feldspathic streaks occur in the rocks and they too are traversed by calcite, quartz and amphibole veins. Several dykes can be seen cutting the epidiorite in the bed of the river. One on the east bank 10 m above the bridge shows a margin controlled by joints in the country rock and is chilled against the epidiorite. In some, stringers of porphyry run out into the country rock, e.g. beneath the bridge where the dyke rock is fine grained, greenish in colour and is a porphyry with phenocrysts of pale amphibole and feldspar in a fine micro-crystalline matrix. Porphyry dykes of this type commonly occur in association with the Caledonian Newer Granites (Johnston 1966, p. 51). Exposures of the epidiorite can also be seen at both ends of the dam, locally with clots of epidote and, again, cut by porphyry dykes with chilled margins. Where the epidiorite enters the aureole of the Comrie igneous complex it has undergone progressive thermal metamorphism. Thermally metamorphosed epidiorite can be seen 400 m east of Spout Rolla waterfall and above the road, but it is not well exposed. Return by bus down Glen Lednock to Comrie and by the same route back to St Andrews. BROWN, P. E., 1991. Caledonian and earlier magmatism. In Craig, G.Y. (Ed.) 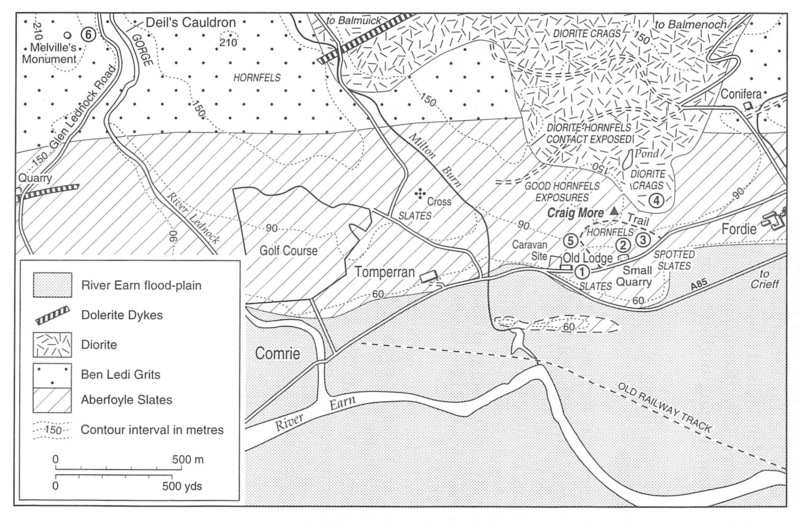 Geology of Scotland, pp.229–95. Geological Society, London. HARTE, B. et al., 1984. Aspects of the postdepositional evolution of Dalradian and Highland Border Complex rocks in the Southern Highlands of Scotland. Trans. Roy. Soc. Edinb. : Earth Sci., 75, 151–63. JOHNSTONE, G. S., 1966. The Grampian Highlands. Brit. Reg. Geol. (3rd Ed.). McDONAGH, M. J. O., 1964. The metamorphism of a basic sill. Unpublished St Andrews Univ. honours thesis. STEPHENS, W. E. and HALLIDAY, A. N., 1984. Geochemical contrasts between late Caledonoid granite plutons of northern, central and southern Scotland. Trans. Roy. Soc. Edinb., Earth Sci. 75, 259–73. TILLEY, C. E., 1924. Contact-metamorphism in the Comrie area of the Perthshire Highlands. Quart. Jour. Geol. Soc. Lond. 80, 22–70. This page was last modified on 23 February 2019, at 09:31.